Boil a large russet potato and mash it and keep aside. Boil mixed vegtables of your choice. I chose carrots, green peas, corn and cauliflower. Once boiled, squeeze out the excess water to let out all moisture from the veggies. In a skillet, add 1 tablespoon oil and add some cumin seeds. Once the cumin starts to splutter add the cashew nuts and fry till mildly brown. Then add the chopped onions, ginger garlic paste and chopped cilantro leaves and saute for 2 mins till the onions start getting pink. Add turmeric powder ,corriander powder and chilli powder and mix well. Now add the boiled and squeezed mix veggies and salt and mix well until everything has blended together and the mixture is dry. Add this mixture into the mashed potatos and mix everything. 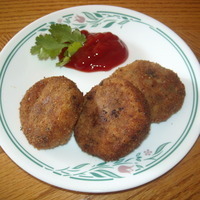 (Do not heat the potatos)..
Use a tablespoon to scoop out the potato veggie mix and roll them into small balls and flatten them with your plams into disc shaped cutlets. In a bowl add some water with all purpose flour and make a smooth thin paste. Dip each cutlet into the all purpose flour paste and then coat it with the bread crums ( I used Italian seasoned breadcrumbs) and keep it aside on a plate. Do the same with the rest of the cutlets. Heat the oil and fry each cutlet until golden brown on both sides. looks very nice and attractive, feel to eat. try to make more good dishes. Looks delicious.feel like to have it.looking forward to making this soon. Looks wonderful, Manju. I've added it to my try soon folder. Looking forward to making this soon! Rich Chocoffee Square cakes ! Pasta Shells in white sauce with sausage, mushrooms and peas!